Things are getting sorted out over here. I tend to flip out a little bit before there are Big Jobs to do, but once I get going I feel a lot better. It’s the anticipation that gets to me. My grad school advisor once compared me to a slow-moving boulder. It takes a lot to get me going but once I gain some momentum, I’m unstoppable with a singular focus. Sneaky Fiasco, I didn’t even realize I was being observed! That’s me in full-on packing-and-sorting mode, see that intense concentration? 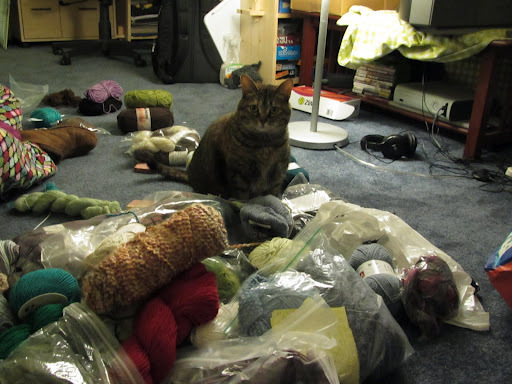 Of course I started with the yarn. Most important thing, amIright? Apparently there’s going to be a big yard sale (or ‘tag sale’ or ‘garage sale’, depending on which part of New England you are from) the weekend we’re moving, so we’re hoping to get some of our unnecessary items taken off our hands that way. 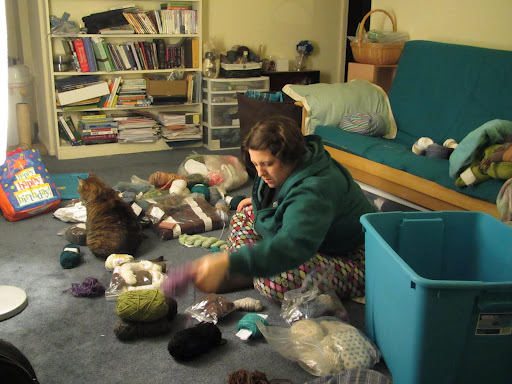 I went through and sorted out some things I felt I could part with for super cheap, some perfectly good remnants and single skeins of things I bought when I first started getting into knitting that I’ve been carting around for the last 3 years. If I haven’t used it yet, I probably won’t, so it’s going. Also, since most of that is commercial yarn, I could always go get more. 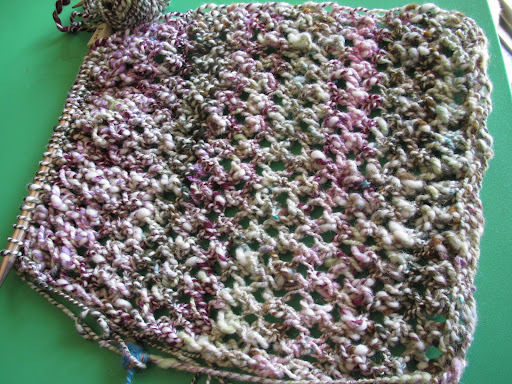 For example, if I absolutely had to knit myself a dishcloth out of Sugar-N-Cream cotton immediately, big box craft stores are never that far away. No Bugga or Socks that Rock will be sold, because those skeins are precious, but some stash baggage cleansing doesn’t hurt. It feels good! You know what else feels good? What are you excited about, lately? This entry was posted in handspun, life by shoelaceswitcher. Bookmark the permalink. Yes, yarn is the most important thing to pack. I probably need to get a third plastic drawer, because my stash is getting bigger That project you are working on looks really pretty and the yarn is gorgeous! I love knitting with my handspun, it's so rewarding.